In the Demilitarizing Security section, the authors suggest the ultimate form of national defense would be a nonviolent civilian defense force. This force would deter attacks by engaging in a variety of nonviolent tactics to make our country more resistant to rule by aggressors. A first step toward such a force would be to have a truly non-provocative defensive military posture. Such a posture would eliminate long-range weapons such as intercontinental ballistic missiles and militarized drones and phase out overseas military bases. The section titled Managing International and Civil Conflicts includes ideas on creating nonviolent peacekeeping forces, reforming the UN, strengthening the International Court of Justice, and working toward a stable, fair, and sustainable global economy. In Creating a Culture of Peace, suggestions are given on how to debunk war myths (i.e. war is inevitable and World War II was a “good war”). The importance of funding peace education projects is stressed. An example of a successful education project of the Chapter 25 Veteran’s for Peace is a scholarship program for high school youth that is based on an essay “Why war is not the answer”. 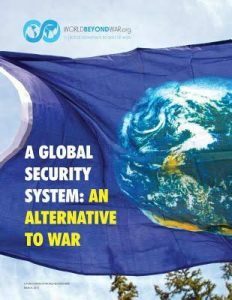 Read A Global Security System: An Alternative to War Free Online here. View or download full PDF version. First Edition from 2015 is here in multiple formats. This entry was posted in Militarism and tagged A Global Security System, An Alternative to War, Creating a Culture of Peace, Demilitarization, Demilitarizing Security, Managing International and Civil Conflicts, World Beyond War on September 5, 2017 by Website Administrator.